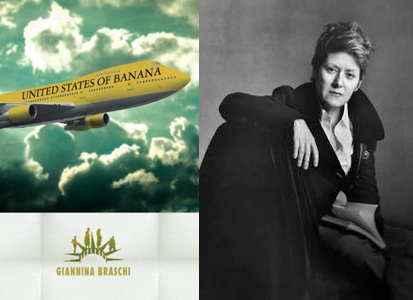 Born in San Juan and based in New York, Giannina Braschi is a cutting-edge poet, essayist, and novelist. She was a tennis champion, singer, and fashion model before she discovered writing. She holds a PhD in the Spanish Golden Age and has taught at Rutgers, Colgate, and City University. She has written on Cervantes, Garcilaso, Lorca, Machado, Vallejo, and Bécquer. Author of the euphoric poetry collection Empire of Dreams, the Spanglish novel Yo-Yo Boing! and the philosophical new work of fiction United States of Banana, Braschi has received grants and awards from National Endowment for the Arts, NY Foundation for the Arts, El Diario la prensa, PEN American Center, Ford Foundation, Reed Foundation, Rutgers University, Danforth Scholarship, and Instituto de Cultura Puertorriqueña. Her collected poems inaugurated the Yale Library for World Literature in Translation. She writes in three languages—Spanish, Spanglish, and English—to express the enculturation process of millions of Hispanic immigrants in the U.S.—and to explore the three political options of Puerto Rico—nation, colony, or state. Braschi dedicates her life’s work to inspiring personal and political liberation. Monkeybicycle: The United States of Banana is a conversation between yourself, contemporary and historical world figures, as well as literary characters about Puerto Rico’s current political climate. Why did you choose to dialogue with Hamlet and Zarathustra? Giannina Braschi: Because I always write about my friends. And Hamlet and Zarathustra are my friends. Because we are prophetic, apocalyptic, and revolutionary. What we have in common is our brotherly love—we carry dead bodies on our backs—and we never give birth, although I am in labor most of my life. I knew Hamlet would give me the poetry, Zarathustra would give me the philosophy, Segismundo would give me the plot, and I would handle the politics. Together we would liberate Segismundo from the dungeon beneath the Statue of Liberty and liberate Puerto Rico from the United States of Banana. Mb: The language used is extraordinary and has a very musical quality to it. This is also your first novel written wholly in English. What is the role of language in your work? GB: I’ve studied music all my life. I’ve sung songs in foreign languages and learned those languages through those songs. I memorized T.S. Eliot’s The Waste Land from tapes before I (mis)spoke English and discovered in Eliot’s dramatic shifts my own music—the anonymity of the voices that come from no where—the Greek chorus that captures the conscience of the people. Zarathustra said poets have not discovered the tones. But I have discovered the tones—I speak in tones—in tongues–and from different cultural registers. I mix languages. I mix genres. I mix myself with eccentrics. Mb: Philosophy, literature, and politics collide through the monologues and dialogues that make up the book. Can you talk about the confluence of these three in your work. Does one inform the others, or are they, like the characters, in a constant dialogue? GB: The characters Zarathustra, Hamlet, and Giannina exemplify the unity of philosophy, literature, and politics. They encounter each other in the streets of contemporary New York, recognize each other, and don’t stop walking, talking, and contradicting each other—but all dealing at the same level—no one thinking he is superior to the other. We see how the powers of the world are shifting and we shift with those shifting powers. We watch the collapse of the Twin Towers as the fall of the American Empire, and we rise into a new world of multiple possibilities where we meet prisoners of war, terrorists, ambassadors, kings, queens, and presidents. It’s a world in which philosophers, poets, and lovers are in power. Mb: This is perhaps the funniest and most enjoyable postcolonial novel I’ve ever read. Though	it deals with very serious and heavy events, such as the destruction of the World Trade Center, the immigrant experience, and revolution, it never loses sight of its humor. What does humor do for us in the face of tragedy? GB: Tragedy is all about losing. And humor is all about gaining perspective. Humour returns our gladness. And with gladness comes generosity. Humor returns us to the light and makes us light—it kills grudges, buries bodies–buries revenge—buries blame and guilt—fear and dread. Laughter, like hiccups and sneezes and farts and burps, relieves us of severity. Colonize your colonizers–they say–learn from those bloody bastards. Which bastards–I ask. The American bastards–they colonized your colonizers–Spain and England–and look how phony they look–like prairie dogs–following the Bushes in the oil fields of Iraq. Mb: The novel deals a great deal with the american empire and the future of Puerto Rico. You describe its options as Wishy, Wishy-Washy, and Washy. What do you believe the future holds for Puerto Rico? GB: Puerto Rico will be Wishy. Some people you will never discover, unless you create them first. Like Cervantes created Don Quixote and now we meet Don Quixotes in the street. Or like Tirso de Molina created Don Juan and now we say that guy over there is a Don Juan. Likewise, some countries you will not discover unless you create them first. I liberated myself from the eternal dilemma of Wishy, Wishy-Washy, or Washy. The United States of Banana is a declaration of independence. Read more from / about Giannina Braschi here. Buy a copy of United States of Banana here.